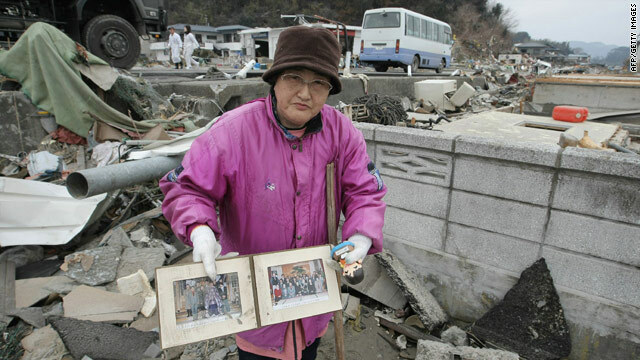 A tsunami survivor shows the family pictures she collected from the rubble of her house in Yamada on Tuesday. [11:30 p.m. ET Tuesday, 12:30 p.m. Wednesday in Tokyo] A white cloud of smoke or steam rising above Japan's Fukushima Daiichi nuclear plant may have been caused by a breach in the containment vessel in reactor No. 3, government officials said. "There's a probability the vapor is coming out of a broken part of containment vessel. This is a possibility," Chief Cabinet Secretary Yukio Edano said Wednesday. A spokesman for Japan's nuclear safety agency later told reporters that analysts were still trying to determine the cause of fluctuating radiation levels at the plant, but that radiation levels may have increased "because the containment vessel in reactor No. 3 has been damaged." [11:01 p.m. ET Tuesday, 12:47 p.m. Wednesday in Tokyo] The reported radiation readings near the front gate of the damaged Fukushima Daiichi plant are fluctuating by the hour, but currently do not pose any health hazard, Chief Cabinet Secretary Yukio Edano said Wednesday. The reading spiked once Tuesday night, he said. Meanwhile, The Japan Times reports that radiation reached around 20 times normal levels in the capital Tuesday morning, the Tokyo Metropolitan Government said, while offering the assurance this reading posed no immediate risk to human health and that the public should remain calm. "I received a report this morning that there was an important change of data," Gov. Shintaro Ishihara said at a news conference. "I heard that it will not immediately cause health problems." [10:47 p.m. ET Tuesday, 11:47 a.m. Wednesday in Tokyo] Chief Cabinet Secretary Yukio Edano said Wednesday workers at Japan's damaged Fukushima Daiichi plant have suspended their operations and been evacuated. At least 7,558 people are missing and 1,990 are injured, according to the National Police Agency Emergency Disaster Headquarters. [8:26 p.m. ET Tuesday, 9:26 a.m. Wednesday in Tokyo] Stocks in Japan opened higher Wednesday morning, one day after the island nation's main market index suffered one of its biggest drops on record, CNNMoney's Ben Rooney reports. The Nikkei 225 index, the most prominent measure of Tokyo market stocks, rose 520 points, or 6%, shortly after the market opened. The rebound comes after intense selling in the previous two sessions. On Tuesday, the index plunged 10.6%, marking the third worst one-day plunge in the Nikkei's history. [6:42 p.m. ET Tuesday, 5:42 a.m. Wednesday in Tokyo] U.S. government experts trying to construct a model of radiation plumes emanating from Japan's Fukushima Daiichi power plant are being hampered by a "paucity of good data," a senior administration official said. [6:24 p.m. ET Tuesday, 5:24 a.m. Wednesday in Tokyo] Some context for the new fire in the Fukushima Diiachi nuclear power plant's Reactor 4 building: This is that building's second fire in two days. The first fire, discovered Tuesday in a cooling pond used for nuclear fuel, coupled with Tuesday's explosion at the plant's No. 2 reactor, briefly pushed radiation levels at the plant to about 167 times the average annual dose of radiation, according to details released by the International Atomic Energy Agency. This chased all but a handful of workers from the site and raised fears of a far more dangerous radiation threat. Tuesday's dose would quickly dissipate with distance from the plant, and radiation quickly fell back to levels where it posed no immediate public health threat, Chief Cabinet Secretary Yukio Edano said. The effect that Wednesday's fire was having on radiation levels and information about the fire's cause weren't immediately available. About 200,000 people living within a 12.4-mile radius of the plant have long been evacuated. Three explosions and two fires have now been reported in various reactor buildings in the past five days. [6 p.m. ET Tuesday, 5 a.m. Wednesday in Tokyo] A new fire was discovered Wednesday morning in the northeastern corner of Reactor 4 building at Japan's Fukushima Daiichi plant, an official with Tokyo Electric and Power told reporters. [4:48 p.m. ET Tuesday, 5:48 a.m. Wednesday in Tokyo] The U.S. military has blocked its own access to a range of websites to free up bandwidth for use in Japan recovery efforts, according to a spokesman for U.S. Strategic Command. The sites - including YouTube, ESPN, Amazon, eBay and MTV - were chosen not because of their content but because of their popularity among users of military computers, spokesman Rodney Ellison said. U.S. Pacific Command made the request to free up the bandwidth. The sites, 13 in all, are blocked across the Department of Defense's .mil computer system. [4:39 p.m. ET Tuesday, 5:39 a.m. Wednesday in Tokyo] The official number of missing people in Japan has risen to 7,558, and 1,990 have been reported injured. The death toll remains at 3,373 but is expected to rise as rescuers reach more hard-hit areas. [4:13 p.m. ET Tuesday, 5:13 a.m. Wednesday in Tokyo] The governor of Tokyo has apologized for saying the earthquake and tsunami were God's punishment for Japanese egoism, a Japanese news service reported. "I will take back (the remark) and offer a deep apology," Tokyo Gov. Shintaro Ishihara said at a news conference, according to Japan's Kyodo News. On Monday, Ishihara had told reporters, "I think (the disaster) is tembatsu (divine punishment), although I feel sorry for disaster victims," according to Kyodo News. [4:02 p.m. ET Tuesday, 5:02 a.m. Wednesday in Tokyo] Iodide pills are being given to sailors as a "precautionary measure only," U.S. Navy spokesman Capt. Danny Hernandez said. The U.S. Army's Camp Zama, about 25 miles outside Tokyo, is also taking steps in light of the potential radiation threat. Messages on the U.S. Army-Japan Facebook page says health officials have been taking "environmental radiation readings every 3 hrs" since Monday and they indicate "absolutely no health risk to our community." The message added "negligible levels" of radiation require "mitigating measures," including limiting outdoor activities, closing windows and keeping children inside. Representatives for the Marines and Air Force said they have not seen any reports of their troops testing positive for exposure. The Navy has three ships en route to Japan to help with disaster relief. They are expected to arrive Thursday. Because of radiation concerns, they will position themselves in the Sea of Japan on the country's west coast rather than the east coast. [3:35 p.m. ET Tuesday, 4:35 a.m. Wednesday in Tokyo] Regarding the staffers of the Fukushima Daiichi nuclear plant, who Kyodo News reported had to abandon the plant control room Tuesday night because of high radiation levels: "Their situation is not great," said David Brenner, director of the Center for Radiological Research at Columbia University. "It's pretty clear that they will be getting very high doses of radiation," Brenner said. "There's certainly the potential for lethal doses of radiation. They know it, and I think you have to call these people heroes." [2:24 p.m. ET Tuesday, 3:24 a.m. Wednesday in Tokyo]The explosion Tuesday at the Fukushima Daiichi nuclear plant has elevated the situation there to a "serious accident" on a level just below Chernobyl, a French nuclear official said, referring to an international scale that rates the severity of such incidents. The International Nuclear and Radiological Event Scale goes from Level 1 to Level 7. "It's clear we are at Level 6, that's to say we're at a level in between what happened at Three Mile Island and Chernobyl," Andre-Claude Lacoste, president of France's nuclear safety authority, told reporters Tuesday. [1:48 p.m. ET Tuesday, 2:48 a.m. Wednesday in Tokyo] The impact of the massive earthquake that struck just off the coast of Japan last week has been felt by tech companies around the world. Dallas-based Texas Instruments said it had suffered "substantial damage" to its production plant in Miho, Japan and slight damage to its Aizu-wakamatsu plant, CNNMoney reports. Both facilities are north of Tokyo in the areas most affected by the disaster. Austin-based Freescale Semiconductor, which is among the largest microchip makers in the United States, said its facility in Sendai, Japan, was closed. [1:29 p.m. ET Tuesday, 2:29 a.m. Wednesday in Tokyo] The beleagured crew at the Fukushima Daiichi nuclear plant had to abandon the control room Tuesday night because of high radiation levels, Kyodo News reported, citing plant owner Tokyo Electric Power Company. They were monitoring data from a remote site, Kyodo reported. [12:40 p.m. ET Tuesday, 1:40 a.m. Wednesday in Tokyo] Operators at the quake-damaged Fukushima Daiichi nuclear plant and government officials are considering a plan to use helicopters to drop water into the cooling pond through the damaged roof of the reactor building, according to a Kyodo News report. Concerns about hot radioactive fuel boiling off cooling water and catching on fire continued into Wednesday. [12:24 p.m. ET Tuesday, 1:24 a.m. Wednesday in Tokyo] Filipino authorities sought to calm panic unleashed among some residents after a hoax text message warned that radiation from Japan may affect the Philippines. Concerns persist about nuclear reactors in Japan since the earthquake and tsunami. The false text message spread like wildfire on Monday. [11:54 a.m. ET Tuesday, 12:54 a.m. Tuesday in Tokyo] Oil prices fell more than $3 per barrel, or about 3%, as investors saw high expectations overshadowed by the impact of the Japanese crisis on the global economy. U.S. stocks also slumped, as Japan's stock market plunged 10.6%. The Dow Jones industrial tumbled 214 points or 1.8%, after being down as much as 297 points earlier. All 30 Dow components were in the red. The S&P 500 fell 23 points, or 1.8%, and the Nasdaq dropped 49 points, or 1.8%. [10:06 a.m. ET Tuesday, 11:06 p.m. Tuesday in Tokyo] An aftershock with a preliminary magnitude of 6.1 struck Tuesday in the eastern part of Honshu, Japan, the U.S. Geological Survey said. It was the latest of dozens of aftershocks following a monster quake with a 9.0 magnitude that hit the area Friday. The aftershock was less than a mile deep and caused shaking that was widely felt. [9:56 a.m. ET Tuesday, 10:56 p.m. Tuesday in Tokyo] The USGS reports a 5.8 magnitude aftershock off the east coast of Honshu, Japan. CNN crews in Tokyo and Hachinohe felt the tremor, which seemed to last more than 30 seconds, they said. [9:43 a.m. ET Tuesday, 10:43 p.m. Tuesday in Tokyo] Tuesday morning, "low levels of radioactivity" were detected from the Fukushima plant by instruments on the USS George Washington at Yokosuka, the Navy said. There was no danger to the public, but U.S. naval forces in Japan recommended measures for personnel and their families in Yokosuka, including limiting outdoor activities and "securing external ventilation systems as practical," the statement said. "These measures are strictly precautionary in nature." [8:35 a.m. ET Tuesday, 9:35 p.m. Tuesday in Tokyo] The death toll has risen to 3,373 as a result of the earthquake and tsunami that struck Japan on Friday, the national police said Tuesday. Another 6,746 people are missing, according to the latest figures, a sharp increase from the 3,743 people who were previously listed as missing by the police. [8:10 a.m. ET Tuesday, 9:10 p.m. Tuesday in Tokyo] Radiation level readings have decreased at the quake-damaged Fukushima Daiichi nuclear plant, Chief Cabinet Secretary Yukio Edano said Tuesday afternoon. "The level has come down to the level to cause no harm to human health, according to the report I have received," Edano said. [8:01 a.m. ET Tuesday, 9:01 p.m. Tuesday in Tokyo] South Korea said it will tighten radiation inspections of meat and fisheries imported from Japan in the wake of explosions at the Fukushima power plant, Yonhap news agency reported. [7:38 a.m. ET Tuesday, 8:38 p.m. Tuesday in Tokyo] Tohoku Electric Power Co. said Tuesday it would begin electricity rationing starting Wednesday, according to the Kyodo news agency. The move, which comes one day after Tokyo Electric Power Co. implemented outages for quake-affected areas, will affect around 45 million people in TEPCO"s service area, the agency reported. [7:11 a.m. ET Tuesday, 8:11 p.m. Tuesday in Tokyo] In areas decimated by the earthquake and tsunami, temperatures were forecast to drop below freezing by Wednesday. [6:47 a.m. ET Tuesday, 7:47 p.m. Tuesday in Tokyo] The death toll in Japan from Friday's 9.0-magnitude earthquake and subsequent tsunami has risen to 2,734, authorities said Tuesday. As of 6:30 p.m. (5:30 a.m. ET), at least 3,743 people were missing and 1,897 injured, according to the National Police Agency Emergency Disaster Headquarters. [5:45 a.m. ET Tuesday, 6:45 p.m. Tuesday in Tokyo] Tokyo Electric Power Company says spent fuel rods may have burned in Tuesday's fire in the building housing reactor No. 4 at the Fukushima Daiichi nuclear plant, causing the increase in radiation levels at the facility. [5:30 a.m. ET Tuesday, 6:30 p.m. Tuesday in Tokyo] The protective measures the Japanese government has taken in dealing with the damaged Fukushima Daiichi nuclear plant are "appropriate," the World Health Organization said Tuesday. "The actions proposed by the Government of Japan are in line with the existing recommendations based on public health expertise," the agency said. [4:39 a.m. ET Tuesday, 5:39 p.m. Tuesday in Tokyo] Hawaii's Governor Neil Abercrombie said the tsunami has caused tens of millions of dollars in damage and he plans to visit some of the damaged areas Tuesday. The tsunami that devastated Japan brought powerful waves to the Hawaii islands last week. Abercrombie has signed a "state of disaster proclamation" because of the damage. The proclamation will allow the state to get federal funds. [4:28 a.m. ET Tuesday, 5:28 p.m. Tuesday in Tokyo] U.S. Secretary of State Hillary Clinton was meeting with Japanese Foreign Minister Takeaki Matsumoto at a G-8 meeting in Paris on Tuesday as Japan struggles with the aftermath of the earthquake and tsunami. Matsumoto thanked the U.S. government for its assistance and encouragement. Clinton offered her counterpart America's condolences and solidarity with the Japanese people. [4:10 a.m. ET Tuesday, 5:10 p.m. Tuesday in Tokyo] The death toll in Japan from Friday's 9.0-magnitude earthquake and subsequent tsunami has risen to 2,722, authorities said Tuesday. As of 3:30 p.m. (2:30 a.m. ET), at least 3,742 people were missing and 1,892 injured, according to the National Police Agency Emergency Disaster Headquarters. [3:34 a.m. ET Tuesday, 4:34 p.m. Tuesday in Tokyo] Radiation level readings have decreased at Japan's Fukushima Daiichi nuclear plant, Japan's chief Cabinet secretary said Tuesday. [3:15 a.m. ET Tuesday, 4:15 p.m. Tuesday in Tokyo] An escalating crisis at a nuclear power plant compounded the human devastation in Japan Tuesday. As the death toll from the 9.0-magnitude earthquake and the resulting tsunami steadily ascended, residents waited with anxiety about radiation exposure. The confirmed number of dead reached 2,478 on Tuesday. The toll is expected to rise as rescuers reach more hard-hit areas. [2:31 a.m. ET Tuesday, 3:31 p.m. Tuesday in Tokyo] Japan's government has imposed a no-fly zone over the 30-kilometer radius surrounding the Fukushima Daiichi nuclear plant "because of detected radiation after explosions" there, the country's transportation ministry said Tuesday. "Normally there are no restrictions for planes to fly over nuclear facilities," the ministry's statement said. [2:20 a.m. ET Tuesday, 3:20 p.m. Tuesday in Tokyo] Japanese stocks closed down 10.55 percent, recovering from deeper losses earlier in the session, as the nation grappled with a crisis at an earthquake-damaged nuclear power plant and the aftermath of last week's earthquake and tsunami. [2:13 a.m. ET Tuesday, 3:13 p.m. Tuesday in Tokyo] The death toll in Japan from Friday's 9.0-magnitude earthquake and subsequent tsunami has risen to 2,478, authorities said Tuesday. As of 2 p.m. (1 a.m. Tuesday ET), at least 3,611 people were missing and 1,892 injured, according to the National Police Agency Emergency Disaster Headquarters. [1:42 a.m. ET Tuesday, 2:42 p.m. Tuesday in Tokyo] A fire at the No. 4 reactor at the quake-hit Fukushima Daiichi nuclear plant has been extinguished, Japanese officials said Tuesday. The fire broke out earlier Tuesday. So far, the plant has seen three explosions and a fire. [1:41 a.m. ET Tuesday, 2:41 p.m. Tuesday in Tokyo] The death toll in Japan from Friday's 9.0-magnitude earthquake and subsequent tsunami has risen to 2,475, authorities said Tuesday. As of 10 a.m. (9 p.m. Monday ET), at least 3,118 people were missing and 1,889 injured, the National Police Agency said. The number of dead is expected to go up as rescuers reach more hard-hit areas. I believe that if getting water to the area is not possible from above(e.g helicopters),perhaps they should consider the opposite strategy. Is it possible to construct a man made lake and submerge the entire area. If complete evacuation has had to be established at 12-50 miles, why not construct athejk jcontainment area of sufficient diameter and elevation fill the lake. This should get the needed water for containment. It is better to used those very handy wool blankets with the small pox virus inside every fold and crany than to build nuclear energy plants. Then we can all sit down in comfort and enjoy some deliciouse roasted turkey with special stuffing. NOT MANY,NOT FEW,NOT ONE,WILL BE EXEMPT FROM YOUR WRATH TO COME. TAKE HEED AND REFRAIN FROM THE FULFILLMENT OF PROPHESY WHERE ALL WILL BE LOST. THERE IS ONLY ONE KNOWN EFFECTIVE METHOD.THEREBY, LET US ALL WHOM ARE SERVICE SENT GIRD OURSELVES WITH THE FULL ORIGINAL ARMOUR AND GO FORTH TO RE-ACCOMPLISH OUR WORK. ...FOR ALL WHOM SEEK COMFORT WILL ONLY FIND PAIN AND ALL WHOM ARE WILLING TO BARE PAIN WILL GAIN COMFORT.NOT ONE IS EXEMPT I SAY FOR EVERYTHING ELSE IS VANITY OF VANITIES. Why is this page no longer being updated? It was extremely helpful for a while. I have room in my Texas home for 4-6 persons in need from the stricken area. I only speak Texan so a little english would help. If not then Im sure we can work it out. There is no charge for this help and Im not a solicitor. Im just a Texas Mother trying to help. Harleypyrate02@yahoo.com. Im sorry I dont have the funds to fly you here but I will be at the Dallas/Ft.Worth Airport when you arrive. This is no way being said to be disrespectful but Governments can be wrong. This Nuclear Event that could happen would be an unprecedented act. No scientists can even come close as to what the outcome could be. Please move your families beyond the recommendations as set forth. Get a thousand miles away or better...PLEASE! It's a great material but it won't stop a reaction. It's only good for storage and insulation after the reaction is ended. If they can get the cores cooled and replace the melted sheathes it can be used to store all the damaged materials and to seal up the plant. Good idea though. if death toll has passed some 3, 600, howcome the Tweet said 7,700? heartquaqeue on 2 april next pay attention at the bridge!!! and the stair in the atomic reactor !Please make the closet-closed! Things are pretty grim when Sam busts out the Goatherd song It's like Neutron Jack Welch meatztasised into a legion of CEOs whose incentives all run the wrong way pillage and dismantle your corporation, fire the workers and enrich yourself. Crazy and destructive, and anti-Fordism, which is what built our country into the wealthiest in the world over the 20th century.